We have heard of E Sridharan IES, doing wonders starting with the Pamban bridge, Calcutta Metro, Konkan Railway and the world class Delhi Metro. Metro stalwarts in the country ..
After retiring from Govt of India at the very respectable age of 79, Sridharan was approached by the Chief Minister of Kerala Oommen Chandy to lead the Kochi Metro. 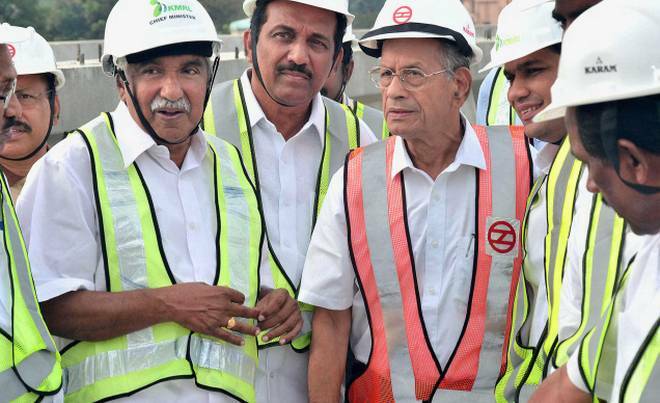 Sreedharan has been associated with the Kochi Metro authorities and Govt of Kerala representatives besides the political representatives for the past four years. 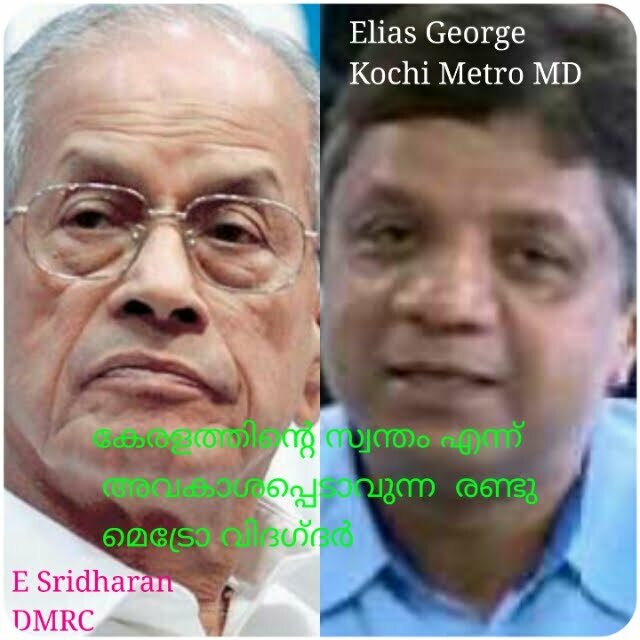 Sridharan and Elias George MD of Kochi Metro have done wonders to get the cheapest, most modern and fastest Metro execution in India. Of the initially planned 25.65 km stretch from Aluva in the North of Kochi city to Petta in the South as part of the first phase, 10 kms stretching from Aluva to Palarivattom will start running in the next three weeks. The trial runs have been successfully completed. Anytime the commercial running for the public can start after the Prime Minister Narendra Modi finds time to come to Kochi for the inauguration in the next two weeks. Meanwhile all other work of sprucing up the stations etc is going on in full swing. 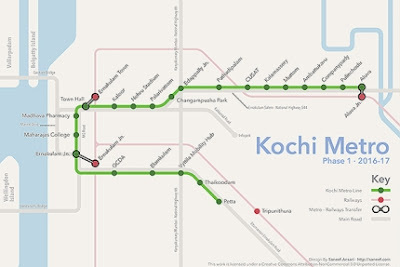 The estimated completion cost of the Metro First Phase (also called Komet or K-3C) from Aluva to Pettah covering 22 stations would cost about INR 5200 crores (app $900 million). Work is also started to extend the northern station from Aluva to the Kochi International airport in Nedumbassery to effect a convenient metro link from the airport right upto Pettah. Alstom of France with its factory at Sri City Andhra Pradesh has been given the $107 million contract to supply most modern 3 bogie, 65 m long and 2.9 metre wide, 25 metropolis train sets to Kochi metro. The Delhi Metro now runs for 213 kms covering 160 stations from the intial 7 kms stretch for which work started on 24 December 2002, serves almost 26.6 lakh passengers daily and has since inception carried almost 1.24 billion passengers. The Kochi metro on completion of the first phase will run for 25.6 kms. In future, we can imagine the development this Mass Rapid Transit System can bring to Kochi and help in its expansion to global standards, even surpassing other Indian and global cities. Having the reputation for the cheapest and most advanced metro project stations in the country, we hope the Kochi Metro will climb greater heights and repute over the years. Sridharan with former CM of Kerala Oommen Chandy at Aluva, 2015 pic. Like the Kochi International airport 5 kms away from Aluva in Nedumbassery, is the first and only insolated (fully solar energy powered) international airport in the world, we hope the Kochi Metro will carve a name for itself in terms of technical specifications, energy efficiency and effectiveness, comfort to people and customer friendliness in the country and the world in the coming days. There is a great lesson in this to learn for the Government of Karnataka executing Bangalore Namma Metro. 7. Always work with the bigger picture of planned city development, passenger safety, low costs and comfort in mind. 8. Have great communication with all stakehoiders and between employees at all stages right from planing to final handing over and running. 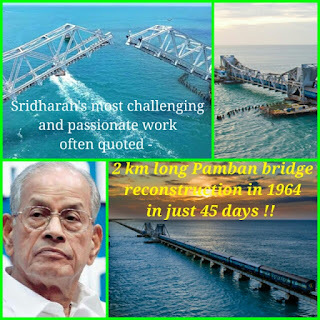 A global wonder, a 2 km bridge reconstructed in just 45 days.. Presently Sridharan is also appointed to the United Nations Organisation, overlooking Mass Rapid Transit Systems in Asia, Africa and Latin America. He has been invited to serve in the United Nations High Level Advisory Group on Sustainable Transport for a period of three years from 2015. (HLAG-ST). Sridharan accepted this 3 year assignment to serve the United Nations at the ripe age of 82 years. !! The country now awaits the Central Govt to start procedures to confer its highest National Civilian Honour of "Bharat Ratna" on E Sridharan !! He is already a Kohinoor to Indians. Bharat Ratna is not going ! 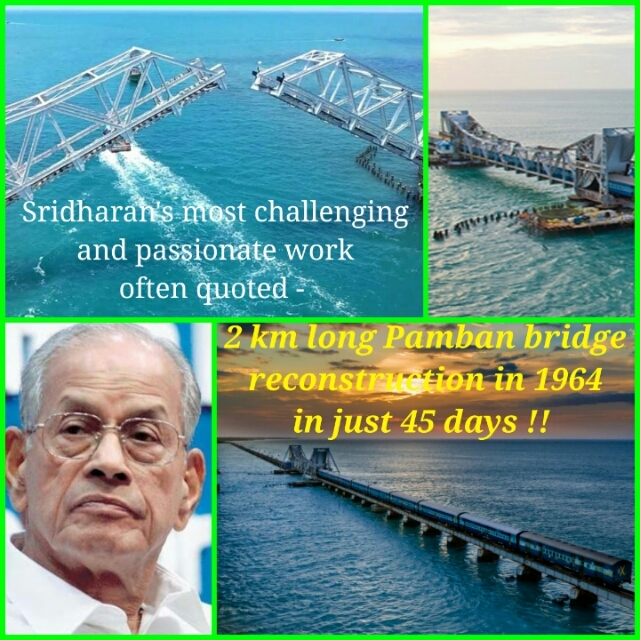 In 1964, after a major cyclone hit the 2 km long, (1914 constructed), Pamban bridge, connecting Indian mainland in Southern tip to Rameshwaram, washing it off, Sridharan inspite of the Army wanting to get it reconstructed in a very short time of 6 months, *got it back and running in just 45 days time* .. 🙏🙏. Sridharan is very proud of this and often quotes this as one of his best achievements ever ! !, when he was just 31 years of age and a bachelor !! An IAF Officer's passion for agriculture ..
Indian boy designs world's smallest satellite ..
Visit to Mango orchard in Begur Bangalore..
North Korea, a few weeks more ..